This is a Fantasy Website Template Design. 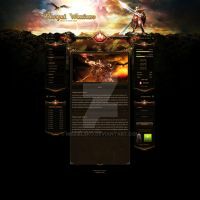 Fantasy and medieval times, is the lead word for this game website template design. This fantasy interface is made for guild or community web sites, browser games or any other kind of fantasy game related websites. Is it just me or has anyone else found that ALL of the above links are dead links that fail to load. What country are these sites hosted from? It's a shame, because I was trying to purchase his work. Hello, is it possible to purchase this joomla template + phpBB skin with discount? I fell "in love" with this the first time i lay my eyes on it. Outstanding work, with great eye for detail. Wish i could afford it tho. All the cool templates are made by you dude. Incredible... I can't stop watching, this details... Amazing, you're the man! If i where a webmaster i would try it! are you the one that made it or ?!? oh yea ... just wandering ... how much did u get for it ? Cool ! Respect ! I love your artwork ! really nice ... love it ! you used photoshop only for this? Du har överträffat dej själv Antonius, asgrymt! Tack du Träffa just Nicklas, han är här i malmö på lite besök. Har fått semester efter han gjort klart senaste Cemical brother musik videon. Du får säga hej från mig om du träffar han igen. wonderfull style and arbrushing work. great details and very awsome layout ! The entire interface looks wicked! But the text menu looks a bit pixellated no? Glad you like the interface design, the menus is webtext to work as a webtemplate. Ya the links are textbased, not image based. you just keep getting better and better i need to steal you! the level and quality of detail in there is just off the hook. I thought i was looking at an official Blizzard website design until i'd read the desc. Impressive work on the header. I have to say fantastic! i like all the detail on the first page the bar at the top looks really profesional. can tell you have spent alot of time making this. the one with the sward looks really cool too. damn. you have so much talent man..
outstanding. you create such life-like designs that look as if you can touch them with your hand. great detail and aesthetics.